The next best thing to planting in your own garden is planting in someone else's. Yesterday, the MulchMaid joined over 80 people in the Overlook and Arbor Lodge neighborhoods to plant street and yard trees with Friends of Trees. We planted over 85 trees in Overlook alone. Here in the Pacific Northwest, late winter is one of the best times to plant trees so they benefit from spring rains while they are first settling in. Friends of Trees has got it down to a science. First, they get all the trees that people have ordered and bring them to a central location. Even leafless, trussed for travel, or bare-root, the young trees look beautiful. Then teams with an FOT-trained team leader and an assistant take their assigned trees to the homes to plant them. Here are my team's trees. We planted a cascara sagrada, a Jonagold apple, an asian pear, two hawthornes, a strawberry tree (Arbutus unedo) and three Douglas firs. We had three of the tree's homeowners on our team. Generally, the tree holes are dug ahead of time. Team leaders demonstrate proper planting techniques and make sure the homeowners know how to care for their new trees. I only managed a few pictures of the actual tree-planting process because everything was so wet - this is Portland, people - and it was pretty muddy. In fact, you could tell the veteran tree planters by their rain pants: my jeans got very muddy! At least I remembered to bring my insulated work gloves. Above, our team has just finished planting a shapely young hawthorne tree in the parking strip of the happy homeowners in the center of the group. They couldn't believe the price: just $14.99. So if it's too early or too wet to work in your own garden, I recommend getting your planting fix (and meeting some new gardening friends) by joining a Friends of Trees event. Check it out - there are still lots of plantings left to go this winter and spring. ...to tiny signs of spring. Mahonia aquifolium is budding out. So is the mahonia nervosa. Archtostaphylos "Austin Griffiths" is blooming. And a no-name camellia is getting ready to bloom. For three years now, I have dug these daffodils out of this bed. I'm not a big fan of most daffodils and these are a weak yellow and frankly just not very attractive. But here they come again. I grudgingly admire their tenacity, so I'll probably cut and bring them inside. I am a fan of daphne. It's easily worth my precious garden space given to this somewhat ungainly shrub to have its scent this time of year. Hemerocallis "Stella de Oro" is actually sending up a flower stalk from the middle of its new foliage. This lime-green kniphofia has been leafing out for a few weeks. It looks like I lucked into a real survivor here: it was missing its tag when I bought it so I don't know much more than its color. The evergreen huckleberries, vaccinium ovatum, are budding. Potentilla 'McKay's White' is leafing out. Yucca filamentosa 'Bright Edge' didn't seem to know it was winter, and it's looking just as good as spring nears. Its wonderful stripes are a real kick in the garden, especially this time of year when there's so little color around. Speaking of color, this succulent has taken on a great reddish-purple, and so has the small heather below. Here's another colorful plant that laughed at our wet and freezing weather this winter. I'm so impressed with the stamina and good looks of these two carex morrowii 'Evergold' in pots on my front porch. They look as good now as they did when I planted them in October - maybe even better. This row of dwarf sweet box, sarcoccoa hookeriana var. humilis, was planted to be the perfect mid-century accent for the roman brick planter along the front of our house, and it's filling in well after two summers. In addition to tolerating the deep shade created by two huge acer negundo street trees, it blooms in winter with tiny pungent flowers. They're hard to see, but great to smell while I'm watching for tiny signs of spring. It's still winter - what's thriving in our Northwest Territory? I recently posted about some sad holes in my 2-year-old Mediterranean garden this winter. But I'm happy to report the Northwest Territory part of our garden is filling in, and it's clearly proving the appropriateness and value of native plants over these last two hard winters. The salal filled in well last summer and is looking cozy beneath a lodgepole pine. The kinnick kinnick (arctostaphylos uva ursi) has almost covered some of the landscape basalt. The ribes sanguineum is bare now, but we're anticipating beautiful early-spring flowers. Behind it, three camellia x 'Winter's Snowman' bloomed back in November, but are continuing to add to our green screen. The little wild huckleberry in front has thickened up, too. A lodgepole pine that had a difficult start has recovered nicely and is looking healthy. Our nice neighbor has given us permission to paint the side of his garage. We'll do that this year: that barn red is pretty overwhelming and it looks terrible behind the magenta currant flowers! The three Western red cedars are probably our the most impressive success. They have filled in amazingly in less than two years: standing on our back patio, I can't see the neighbor's kitchen window. What's more, I can't see their window from inside our bedroom window now, so they can't see in, either. Looking south, mugo pines, a hellebore, mahonia aquifolium and more kinnick kinnick are helping to cover the vine maple (acer circinatum) bed. One sad note: we're losing the second of three small rhododendron impeditum. I've pulled out the first dead one and you can see the second one at the inside corner of the patio is browning out now. I know they don't like wet feet, but this little bed has new soil, is mounded, and drains well. It's perplexing and sad to see them go belly up, but when two out of three do it, that's a clear message. We need to find some substitutes, but I'll miss their tiny, bog rosemary-like leaves and their soft mauve flowers. A tougher native of some kind is in order to replace these little shrubby hybrids. This picture doesn't show a native and it's not in the Northwest Territory, but I had to include it because it's such a success story. I think nandina domestica tends to get passed over by serious gardeners because it's so easy to grow and it's been ubiquitous in commercial landscaping for years. But I love the winter leaf color, and mine still have a few bright red berries hanging on. Besides, I like the way nandina looks in my garden all year round - it's not just for winter. It's Bloom Day, the 15th of the month, and the day garden bloggers share what's blooming in their gardens. Sadly, not one thing is blooming in the Mulchmaid's garden this month. She's forced to consider the indoor garden, and honestly, there's not much action there, either. In fact, there are just two things blooming indoors. The happy-looking aglaonema, above, lived with us for many years in a small pot. And it thrived. But as soon as I divided and repotted it last summer, it went into overdrive. This is the first time we have seen it bloom in the 20-plus years we've had it. It must be repaying us for the long-overdue move. And somebody needs to tell the little rosemary cutting below that it's the middle of winter. It won't be me, because I love that it's been blooming for weeks now and still has lots more buds to go. Visit May Dreams Gardens to see what else is in bloom today. It's time to take a hard, cold, winter look at the Mediterranean area of our almost-2-year old garden. First, a refresher on its summer aspect, below. Being the eternal optimist, I earlier figured that zonal constraints just didn't apply to me or my plant choices. I don't mean I planted with complete abandon, but I definitely imagined a more cold-tolerant group of plants than I apparently have ended up with. 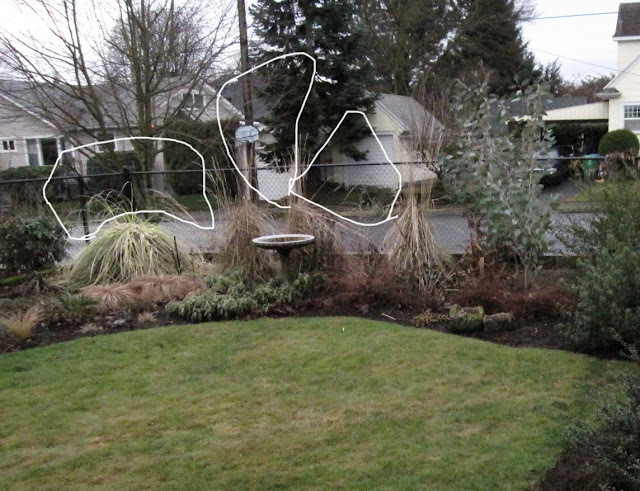 Below is a view of the same area of the garden this winter. There are some major holes in our privacy screen created by plants that are either under-performing or dying a messy death. First off, the cortaderia selloana pampas grass has been slammed for the second time by our weather. 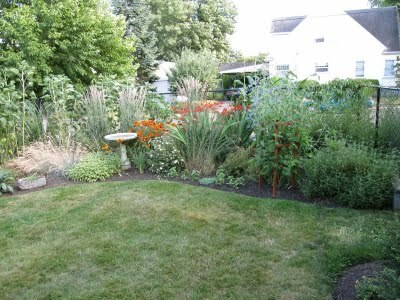 It was planned as a large, evergreen anchor for the southeast corner of the garden. Not happening. All the flaxes have likewise been slammed into sad little piles of reddish-brown strips. They were going to be 4-5-foot red-foliaged specimens on the south end of the garden. Not this coming year, anyway. Looking from the south sidewalk, our back garden privacy is practically non-existent. One area is somewhat private, below. The eucalypt and the ceanothus, assisted by the pyracantha and evergreen clematis, are screening and covering to an extent. This is the most satisfying section of the Mediterranean garden area, from either side of the fence. So what to do with these holes? 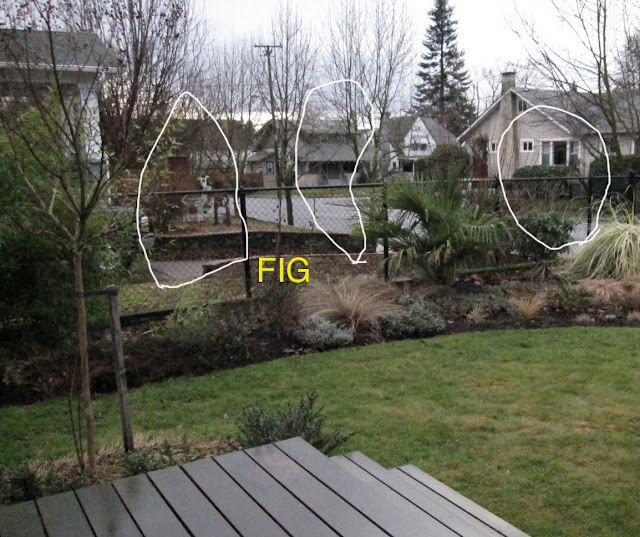 The fig is deciduous, so it will be back in the spring. If I'm patient enough, I can shape and then underplant it when it gains some height, getting some winter coverage of that part of the fence. The trachycarpus fortunei windmill palm is a nice blob of winter green and will have more presence as it gets taller. It will also allow for underplanting as it grows. The pampas may need to go. The feather reed grasses are nice in summer, but were never intended as a long-term solution. One option is to move the arctostaphylos 'Austin Griffiths' from the Northwest Territory area to a place in the Mediterranean garden. It provides a similar open-foliaged screening style to the eucalypt, and it needs to be moved anyway before it gets any larger. Whatever my eventual decisions, this is the perfect time for the MulchMaid to consider them. As much as I love summer, I value my views out of our windows year-round: they need to be satisfying in the cold light of winter, as well. Incidentally, my apologies for the erratic spacing and placement of elements in the last couple of posts: I'm having a terrible time with Blogger's new "improved" posting interface. Technology.....yeah.